Did you know that US companies spend around $14 billion per year on leadership development? If you combine this with all of the other spending on leadership development and you get a ton of people focused on getting better at leadership. I was thinking about this recently and I think it all boils down to both the most exciting and most frustrating part of leadership. Leaders are never satisfied. Nearly every time I get to the finish line on a goal that I care about I decide to move the finish line. If there is more that can be accomplished I want to accomplish it. Though I do pause to celebrate a bit before going further. Do I sometimes wish that this wasn’t how I thought? Yes! It would be much easier to check something off the list and to never look back. I would be more comfortable to leave well enough alone. But that is not how my brain is wired. 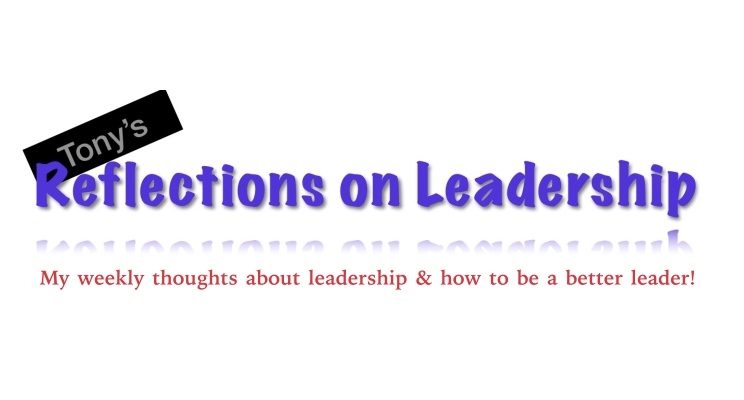 And, judging by the size of the leadership development industry, it is not how many leaders brains are wired. One word of caution though… don’t let your lack of satisfaction with complacency turn into more than that! Be happy with the journey, celebrate your achievements, be proud of yourself and keep striving for more. Call to Action: are you coming up to the finish line for one of your goals? Look beyond it and ask yourself “what’s next”… don’t be satisfied when there is more you can achieve! This week was Thanksgiving week and it caused me to pause and reflect on how thankful I am that I decided that it was time for this fitness journey. I have come so far over the past 17 months and I couldn’t be happier with my accomplishments. Well… I could be happier if this last 5 pounds would magically disappear! In this week’s blog update I am going to talk about 2 things that are signs of how far I have come. One of them is about calories in and one about calories out. 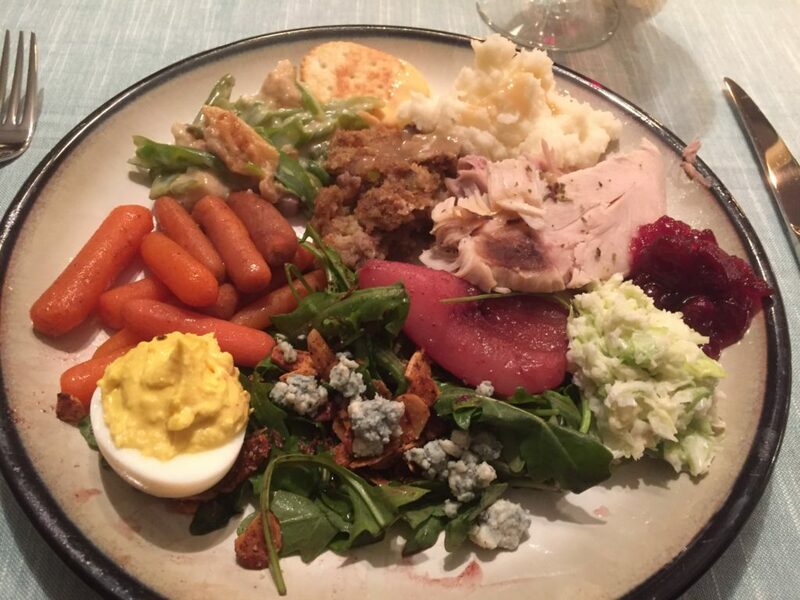 As I went into Thanksgiving dinner last year I had a ton of anxiety. My fitness journey was still pretty new to me and I worried that I was going to derail myself with dinner. I kind of obsessed over it and it dominated my thoughts for a few days leading up to the meal and throughout the day. Then at dinner I employed an “eating strategy” and worked hard to make sure that I was careful about my food. Fast forward one year and things are a little different. I was confident going into Thanksgiving dinner and I knew how to be successful. I knew where the calories would be and had prepared for the meal. I really enjoyed the meal and the company and there was zero anxiety. Then I went back for 2 more small helpings of certain foods always including more vegetables and turkey for the protein. I even tried all 3 dessert items that were at the dinner in small but satisfying amounts. I also drank a couple of glasses of wine. I have gotten smarter, better and more confident with my choices and my abilities. I also do the work to make sure that I can eat almost anything I want. I am no expert by any means but I am comfortable that I have enough expertise to really enjoy living my fitness life. I mentioned above that I do the work to make sure that I can eat almost anything I want. That work comes in the form of lots of exercise. I never expected to enjoy exercise the way I do and I definitely never expected to be calling myself an athlete. But here we are… I am an athlete. I am a runner. Plus I am a bit of a bodybuilder but not enough that I would call myself that at all because I am just working to shape some areas of my body and to build strength. 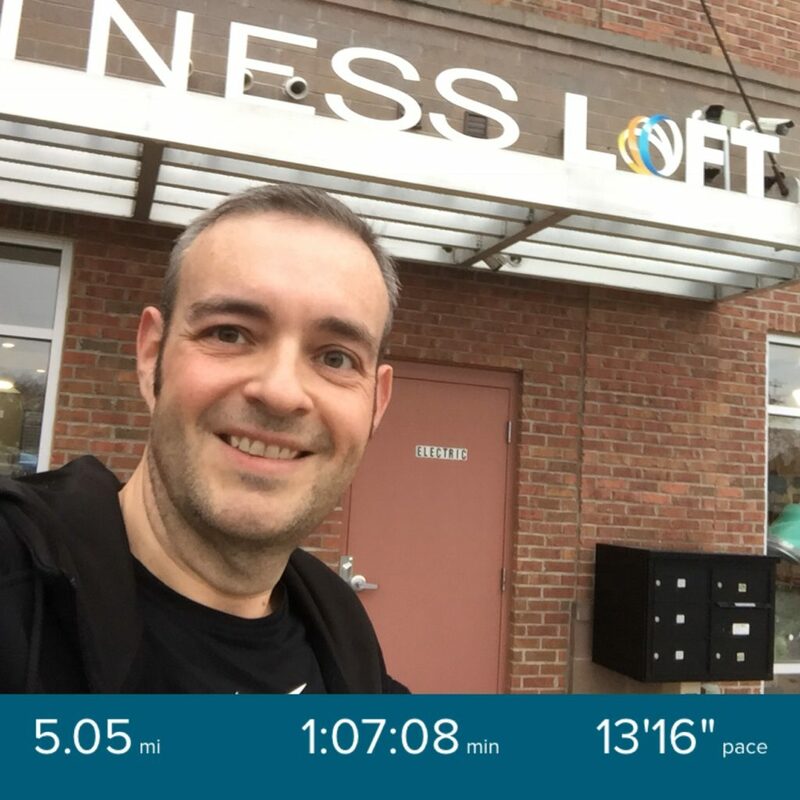 This week was a particularly active week for me given the Thanksgiving holiday and having time off work to workout without time pressures. I will start with the light days: Monday and Wednesday were non-workout / rest days for me. 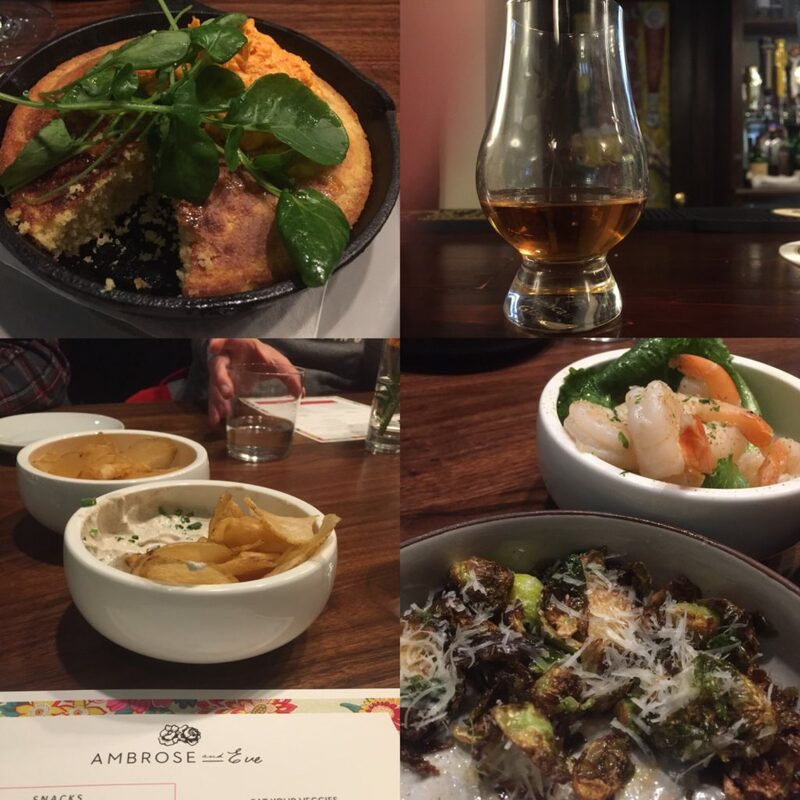 In fact Wednesday was actually the opposite of a “work” day because of an impromptu Friends-giving with super delicious but high calorie foods and drinks at the soft opening of a new restaurant in our neighborhood. So those were definitely not work days! The rest of the week I worked hard! Probably too hard without enough recovery time. On Tuesday I had a session with my trainer Theresa at The Fitness Loft. It was a killer workout focused on a ton of arm, shoulder and back exercises plus some cardio. The most impressive part was that I increased my deadlift weight to 175 pounds. That is 90% of my bodyweight and my goal is 100% of my bodyweight by the end of the year. I have progressed very nicely. My new challenge with the continued increase in weight training is to consume enough protein every day to feed the muscle growth. My new protein target is 150 grams per day and getting there without blowing my calorie budget is very difficult! The other area where my week included hard work was running, my normal go-to for exercise over the past year or so. 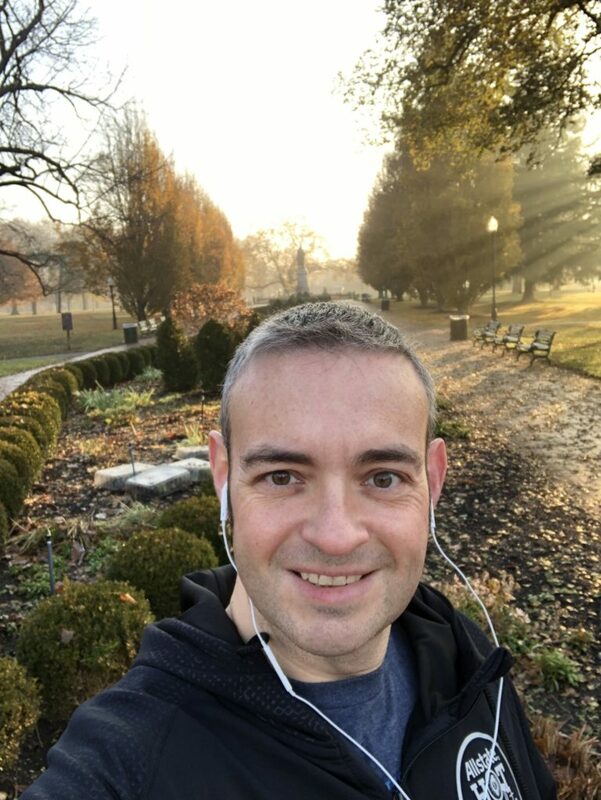 On Thanksgiving morning I ran my first 10K. I ran a “remote” Turkey Trot race with a friend of mine. It is “remote” because participants aren’t doing it together or even at the same time. Plus the distance is up to each participant – 1K, 5K, 10K, half marathon. I decided that this was the time for a 10K. Signing up for this race was a way of keeping myself accountable for running on Thanksgiving morning instead of just riding the couch. I knew that if it was raining or cold I may not want to run outside and my gym was closed. So there was a possibility that I would give myself a pass on exercise on Thanksgiving morning which would lead to dinner anxiety. So I signed up for the race and decided to do it with a partner. Thursday morning was cold! It was only 30 degrees but felt like it was in the lower 20s. I am glad that I signed up for the race otherwise I may have stayed indoors. That would have been a big mistake too because the cold mostly went away as we started running. My running partner for the morning was faster than me (and much younger, and fitter and former military) but I kept up with her through the whole race. This means I worked REALLY hard. 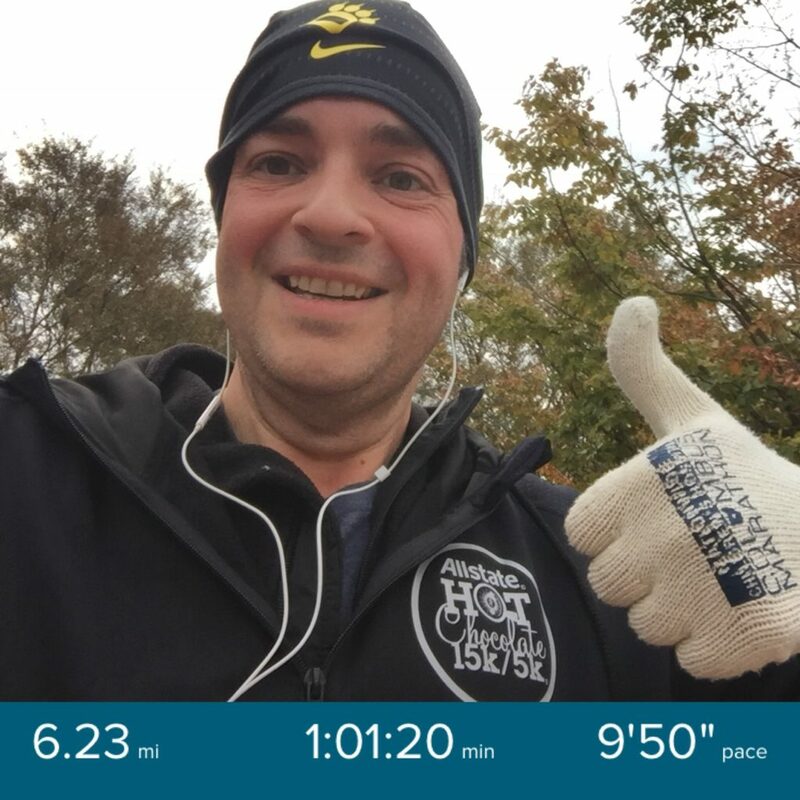 My fastest time was in mile 4 when I ran a pace of 9 minutes 10 seconds but the other miles all averaged 9:23 to 9:47 (around my new normal pace). The only exception was mile 6 which I did alone and did alternating walking/running. I did that because I kind of hit a wall at mile 5 and was pretty exhausted but I pushed through. I ended the race at a total time of almost exactly 1 hour and an average pace of 9:50. I am very comfortable with that result for such a long race on a cold morning. Plus this meant that I burnt over 1000 calories before my Thanksgiving eating (more when you count some walking too!). I didn’t stop with the one workout and one race either. On Black Friday morning I went to the gym and worked out for nearly 2 hours. I started with running a 5K on the treadmill. Then I did a weight lifting circuit including deadlifts of 165 pounds. I ended with a stretching routine to help my sore muscles. I really try hard not to run on consecutive days because I want my body to recover. On Saturday morning I was back at it. I went back to the gym and did an hour on the treadmill. 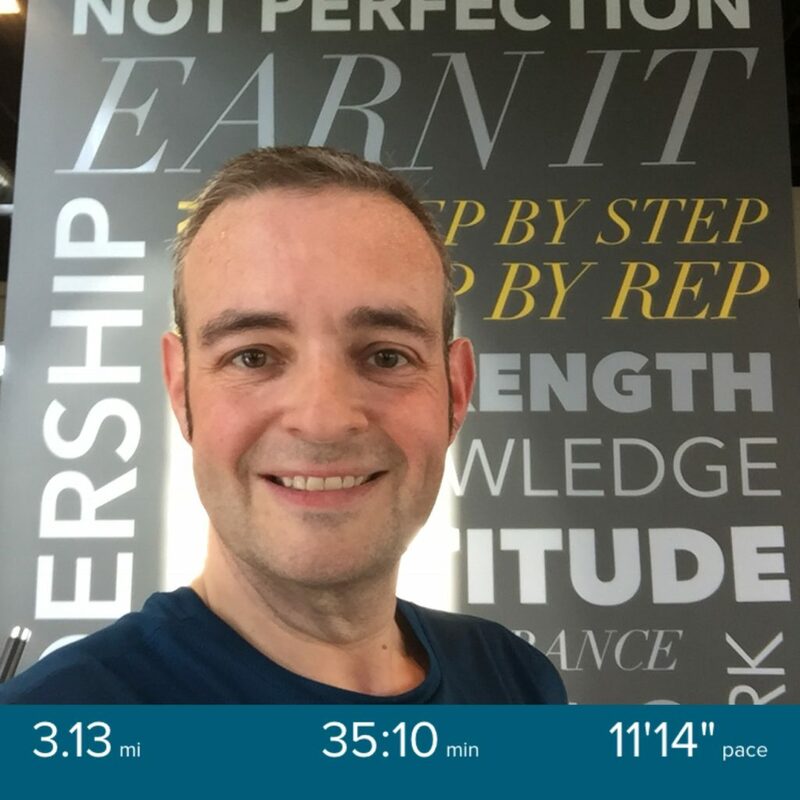 I did a 5-mile treadmill interval training where I would run a minute at a very fast pace and then walk a minute to recover. It was a pretty great workout and burnt almost as many calories as my full 6.25 mile run on Thanksgiving! I finally planned to have a rest day today but couldn’t help myself. It was such a beautiful, chilly but not cold, sunny and slightly foggy fall morning that I had to go outside. So I went for a 3 mile walk around my neighborhood. Later this afternoon Liz and I may even go out for a hike. I am amazed with how much has changed for me in just a few short months. I am now a fit athlete who loves to exercise. I spend “vacation” days making myself sweat and pushing myself to go a bit further, a bit faster and lift a bit heavier. I really love my new lifestyle! Next weekend will be another race, the Columbus Jingle Bell Run, and I will be working on another personal record. So check back next week to see how I did! 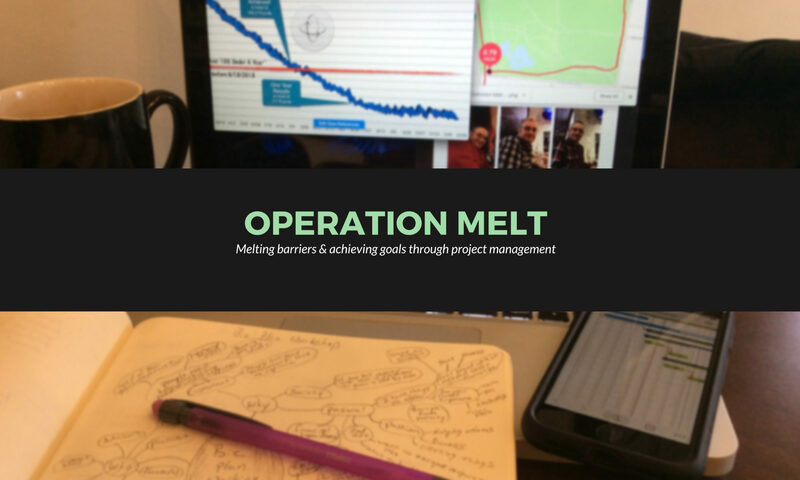 The best leaders engage in ruthless prioritization. They make sure that the places they invest their time are the most important and worthy of their time. This is how leaders drive their teams to accomplish the biggest goals. Sometimes ruthless prioritization means that a leader has to prioritize one important thing over another also important thing. As a result there may sometimes be things that are still important that don’t get prioritized to the top of the list. That is why this week’s Reflections is so short. I prioritized other things over writing this week’s post and am not sorry at all. I prioritized going to an OSU basketball game and then to dinner with my wife Liz. Then I prioritized going to bed at a reasonable time and getting a good night of sleep. Unfortunately prioritizing those two activities meant that I deprioritized writing and didn’t have much time. Surprisingly enough my decision to deprioritize writing my Reflections this week actually turned into a good reflection on leadership. Call to Action: evaluate where you are investing your time each day. Are you choosing the activities that are most important to you and to your goals? 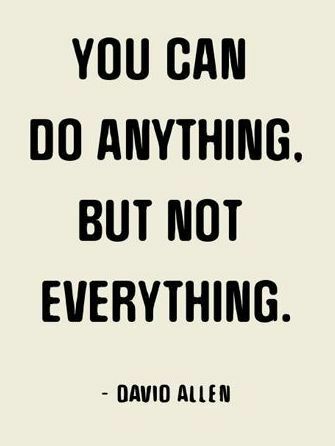 If not you need to ruthlessly prioritize the things that are most important to your goal. Have a safe, happy and productive Thanksgiving! I have a confession to make… throughout my fitness journey I have continued to drink alcohol. I have achieved my fitness results without going dry. In fact I drink fairly regularly with meals and when going out with friends. Like everything else I made drinking alcohol fit into my plan. Drinking alcohol is never never really a healthy choice. Beyond the consumption of the alcohol itself it is also very high calorie without any associated nutritional value. So I really believe the healthiest option is not to drink alcohol at all. If you do choose to continue to partake during your fitness journey there are 3 major strategies to help make it a little healthier. Like many other areas of your fitness journey size matters! I have walked into some chain restaurants and ordered a beer and have watched it come out in a 22 or 32 ounce massive glass. That is a lot of alcohol to be considered, in your mind, as being just one drink. When you think of drinking a beer the normal portion size is 12 ounces which is the size of a can or normal bottle of beer. When you order draft it usually comes out as a pint which is 16 ounces – one and a third servings. Every ounce adds calories! So the first strategy is to manage your portion size. Always order the smallest drink you can order versus the largest. Most of the time I even ask to do a half size beer (a “half draft”) which is only 8 ounces. You get a good taste of the beer but not as many calories. By ordering a smaller portion your brain counts it as a drink as much as it does with the bigger drink. If you want more you can order another which forces your brain to count it as a second drink. Plus this will force you to pause and think whether or not you really want a second drink while you wait for your server to ask you. I know I talked a lot about beer but the same strategy applies to other drinks too. Maybe don’t order the mini pitcher of house margaritas and order the normal size skinny margarita instead. It is usually better for you and made with real juices! Staying on the topic of types of alcohol brings me to the next strategy which is proof. Proof is a measurement of the alcohol content in a drink. The average light beer is around 4.5% alcohol by volume (ABV) which is 9 proof – always double the alcohol content. Red wine is usually around 12% alcohol (24 proof). Liquor is around 40%-50% alcohol (80 to 100 proof). Disclaimer: following paragraph is a slight over-simplification but is directionally accurate. One important fact to keep in mind is that alcohol is essentially sugar. The more alcohol content in a drink the more sugar content which means more calories. So the strength of the alcohol you consume directly translates to more calories. More calories going into your body means that you have to burn more calories or you gain weight. What does all of this mean? It means that you have to choose your alcoholic drinks very carefully. For example let’s talk about beer again. I previously said that the average light beer has an alcohol content (ABV) of 4.5% or so. This 4.5% ABV beer translates to about 120 calories for 12ounce serving. For comparison sake this is about the same as an ounce and a half of grilled strip steak! It is also roughly the same as a 2 ounce shot of liquor or a 5 ounce glass of red wine. But all of those are just averages! There are some imperial IPA beers that have an ABV of 9% or more, some more than 15%! One example is a imperial red ale that I really love that comes out every fall. It has an ABV of about 8% and it is delicious! But ordering a pint of this beer will cost you 320 calories! That is about two-thirds of the calories of a very popular fast food burger with its special sauce and all. That is just for one drink and there are far higher ABV beers out there now. This gets even worse when you look at specialty mixed drinks at restaurants with lots of high proof alcohol and mixers. Some can get up to 1000 calories… for a drink! So choose wisely when choosing a drink! Look for lower ABV beers because you know you are going to drink them fast. I usually look for the lowest ABV beers on the menu. Alternatively, sip on wine that is that same calorie content per drink as a light beer but you consume it way slower. Or sip on a bourbon – one of my go-to choices – because you will likely consume it far slower and in small quantities. Finally is pairing. The alcohol you drink is unhealthy enough but what comes with it could really be the double whammy that really gets you. When you have a beer what do you have with it? Do you snack on high calorie salty snacks like chips, pretzels or peanuts? Do you order that plate of chicken wings? If you snack on unhealthy foods while drinking you are potentially doubling or tripling the calories from the alcohol alone or worse. The foods that you pair with drinks matter as much or more than the drinking itself. When you are drinking alcohol are you mixing it with something? These mixers bring an extra dose of calories and other challenges with them. Here’s an example: I had a Bloody Mary with my brunch this past weekend and did some math. The vodka in the Bloody Mary was brought a fairly moderately amount of calories at around 125. Then there was Bloody Mary mix which brought an extra 40 calories. But the calories are just the start. The mix also came with almost 1100 milligrams of sodium which is a big torpedo in my 1500 milligrams per day sodium budget. The strategy that I commonly employ with my pairings is to make sure that I am eating healthy foods when I drink. If I snack I am doing so on low calorie high nutrition foods such as vegetables. Then I try to stick to straight drinks without mixers except on rare occasions. Finally I try to make sure to ramp up the water intake with my drink. I strive to achieve at least a 1-for-1 consumption of water per drink. If I drink a 12 ounce beer I try to drink at least 12 ounces of water with it. This keeps me from being adversely affected by the natural dehydrating affects of alcohol. The increased water intake also helps work as an appetite suppressant so I don’t hit the snacks. There you have it, 3 strategies that I have used to make my drinking a little healthier. But, without a doubt, the best strategy is not to drink or not to drink often. If you choose to do so at least make sure that you are taking some steps to mitigate the associated negative health impacts. This was another productive week in my fitness journey. I got back on track after a big weight fluctuation upward plus I completed another race with another personal record. Today was the Allstate Hot Chocolate run in Columbus supporting Make A Wish. 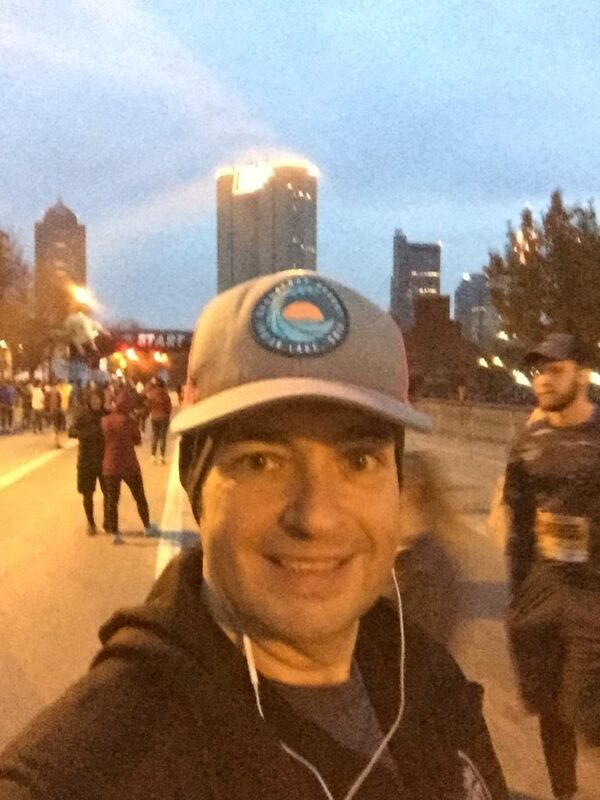 I joined over 10,000 others to run either the 5k or 15k race. I ran the 5k. It all started on Friday with the race expo at the Columbus Convention Center. I picked up my packet, my bib and all of my race swag. Plus I ended up getting a ton of chocolate handed to me at the expo. That was concerning because it would be very easy to consume as many calories as I burn. On Saturday I chose not to take a rest day but I did take it a little easy. Just like the Columbus Marathon I decided just to go for a long race day eve walk. 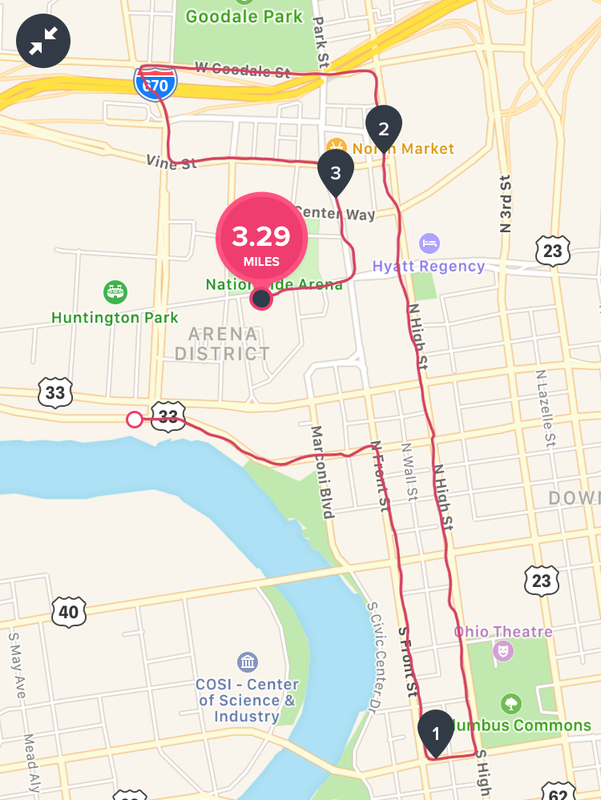 I took a walk through downtown Columbus and back along the Scioto Trail. It was a reasonably cool but not cold morning so it was a nice day to be out. I ended up doing more than 6 miles. After going to bed early last night and not sleeping very well my 5a alarm came VERY early this morning. But I got up and got dressed and headed downstairs to eat some breakfast. My pre-race breakfast included peanut butter toast drizzled with a little honey with a glass of water and a cup of coffee. Then I got all of my gear on and walked out the door. I headed downtown around 6a. I parked at the same meter as I did for the Columbus Marathon and walked about a mile to the starting line. I hung out there with the other runners for about an hour in the cold. It wasn’t as cold as marathon morning but it was chilly this morning. Fortunately I have gotten pretty good at dressing for cold runs. 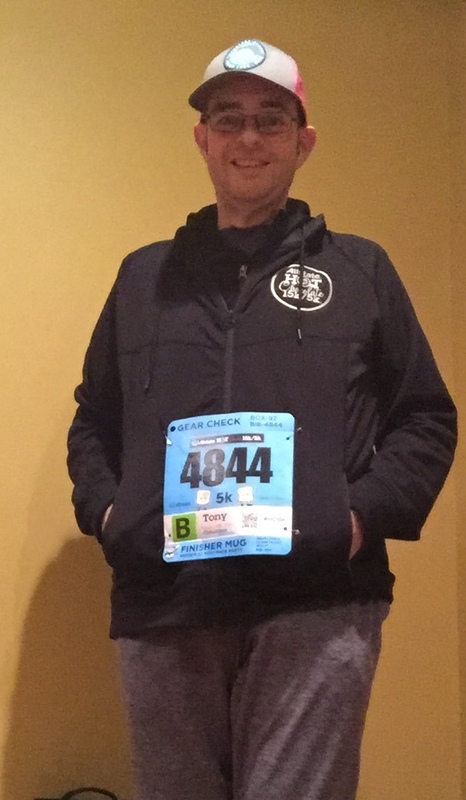 This got even easier since part of the swag for the Hot Chocolate run is a nice running jacket. At about 7:33 corral B (where I was) crossed the starting line and we were off. 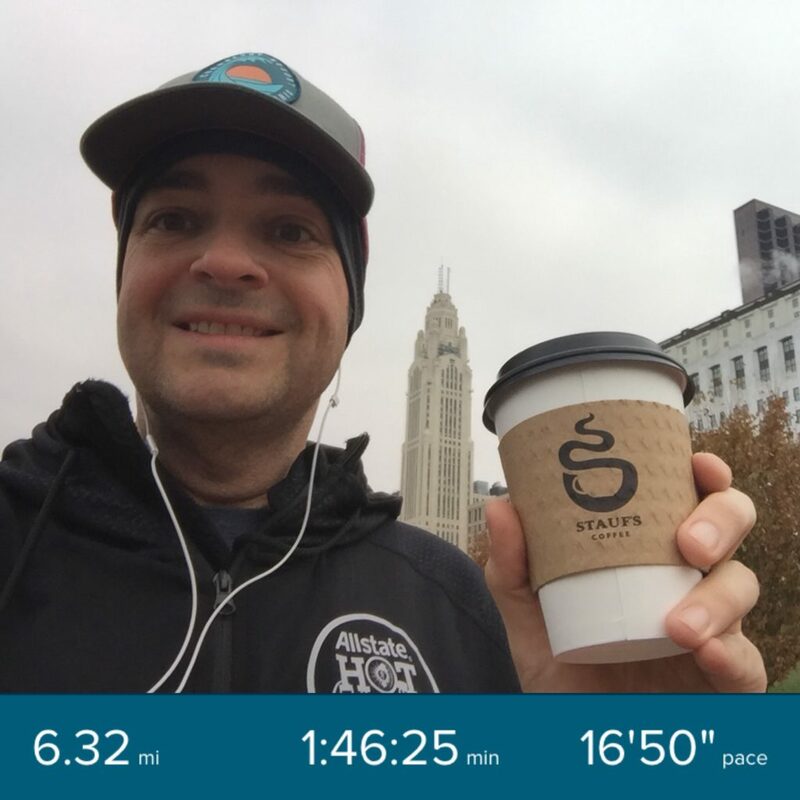 The 5k course snaked through the very familiar streets of downtown Columbus and into the Short North. The course covered many places that are common walking and running routes for me I just haven’t done it in this particular route. 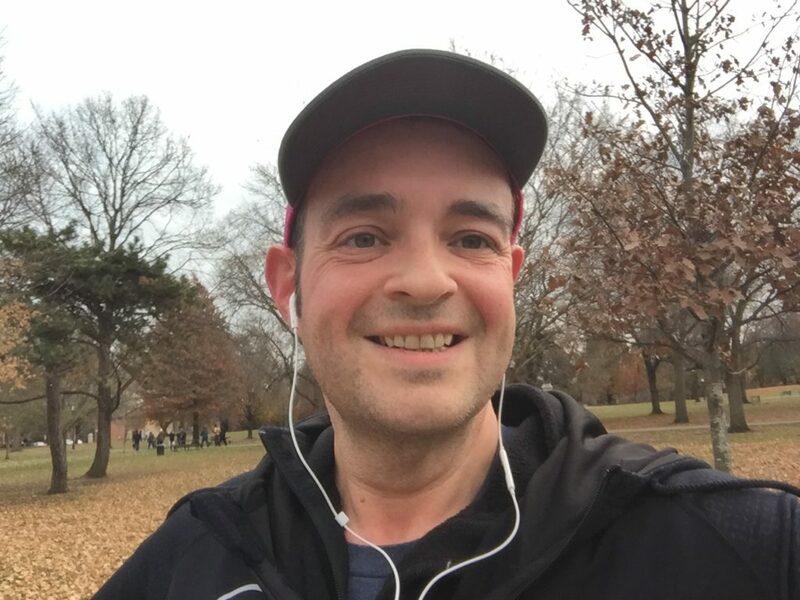 One thing I discovered is that the course seemed to be uphill the whole way… that’s not cool! The run felt good. My music was finding all the right songs and kept me pretty loose and comfortable. The crowd was good but not overly dense so there was plenty of space to speed up and slow down. I started running with the 9:30 pacer but ended up speeding up a little bit and losing him. I started seeing signs counting down to the finish line so I kicked it into high gear. I went into a full-on sprint for the last 300 meters. 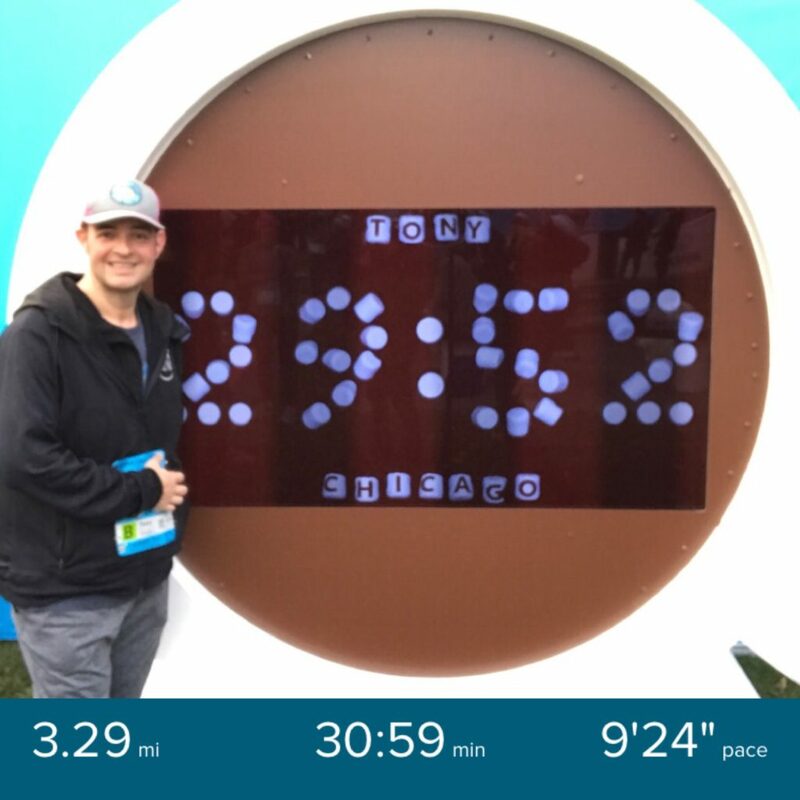 I crossed the finish line at the 29 minute and 52 second mark though I forgot to stop my fitness tracker until a minute later which skewed my time a bit. 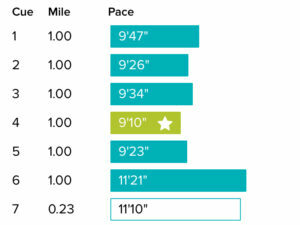 I had planned to set a personal record of a 9:45 pace which was a bit faster than the 9:49 pace I ran at Oktoberfest. I did much better than that and achieved a solid personal record. My final official time was 9:37! 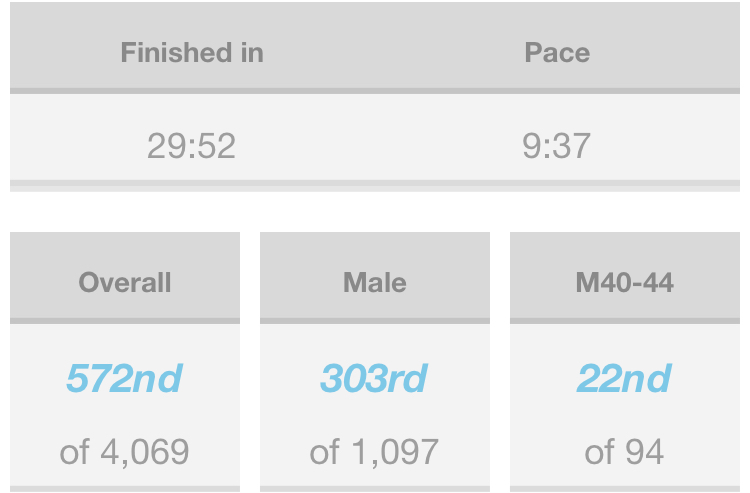 I finished in the top 25% for my age group and the top 15% overall! For the Hot Chocolate 5k there are no medals, they are reserved for the 15k. But there is a major award. Finishers get the official “finishers mug” filled with chocolate. The finishers mug includes hot chocolate (of course), chocolate fondue, marshmallows, a Rice Krispies treat and pretzels. So plenty of things to dip in the fondue to enjoy it. The trick is to eat it very quickly before the cold turns it into a chocolate brick. The good news is that was NOT a problem! As I have gotten more and more fit my body has become way more efficient. As a result a 5k means that I only burn around 500-550 calories. That’s not a ton of calorie burn particularly when compared to Saturday’s walk that burned over 1000 calories. But it is still an ok addition to my daily calorie burn. 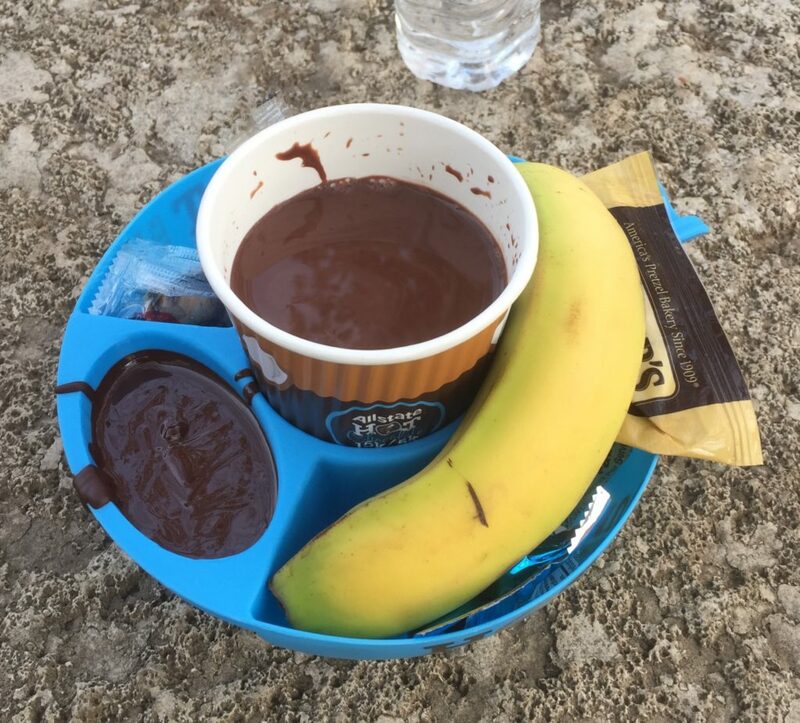 The challenge with the Hot Chocolate race is that the finishers mug full of chocolate and snacks isn’t low calorie by any means. The mug totals over 400 calories. So, doing the math, I only burned a net of about 100 calories. Then I tagged on another 200ish calories walking to and from the race. But that is still more calories burned than anybody lounging on the couch! Today’s race is not my last one of the year. I am scheduled to run the Jingle Bell Run on December first – that may be pretty cold. Plus I am considering signing up for something on thanksgiving morning but haven’t done so yet. But that will wrap up race season. With 1-2 more races ahead of me I am hoping to improve my time even more. Then my training will begin for my next half marathon, the Cap City Half Marathon in April. I will also be signing up for some early spring 5k races and maybe a 10k in there! I guess I am a runner and an athlete now and getting better every day!